VPN (Virtual Private Network) is simply a private connection that routes through a public network (the internet) to link remote sites or users. VPN helps to create a reliable and secure connection between business networks over the internet. Besides, it enables users to access local network resources from anywhere. However, like many other technologies, VPN may develop some issues when you try to access the internet through your browser or other application. In this article, we will focus on how to troubleshoot and fix VPN problems in Google Chrome. Related: Fix Wi-Fi connection issues in Windows 10. Do you have Chrome VPN Issues? Chrome failing to connect when paired with a VPN is common. Nevertheless, before you start fixing the problem, it is important to rule out any connection problems. Check the network icon and ensure your computer has the internet connection. On Windows 10, you can look at the system tray on bottom right edge of the screen. And on MacBook, check it on the top Apple menu bar that shows WiFi icon. The warning symbol on the network icon indicates you have limited or no internet access message. Check out our article on how to fix this limited internet connection issue. If you have no internet connection, properly connect the PC either using Ethernet cable or Wi-Fi. If the problem persists, you can restart your modem or computer and check whether the problem is solved. If you can access webpages without VPN then it could be a problem on Chrome browser. You can try the following options to fix VPN connection issues in Google Chrome. 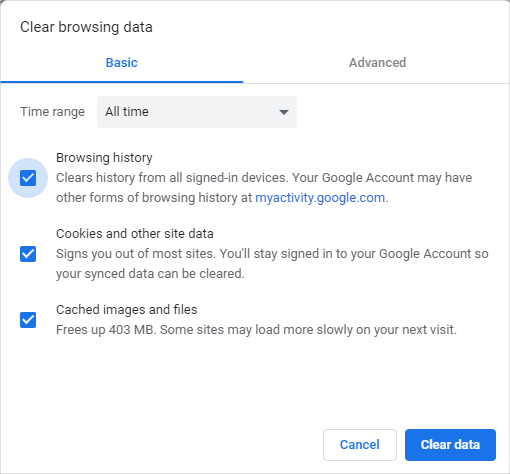 Google Chrome saves data from websites you have visited to enhance your browsing experience. However, these files can accumulate and interfere with VPN integration as well as secure channel connections. Clearing browser data can solve Chrome VPN issues. Navigate through Chrome Menu and select “Settings”. Browse down the settings page and expand the “Advanced” settings. At the bottom of the “Privacy and security” menu list, click on “Clear browsing data”. From the pop-up window that appears, ensure to check the History, Cookies and Cache boxes. Then click the blue “Clear data” button. Restart Chrome and try connecting to the websites. The network connection problem can result from conflict between VPN and Proxy server, as they tend to block each other. Therefore, it is advisable to check the configurations and disable Proxy if it is on. Expand the Chrome drop-down menu and open the “Settings” page. Scroll down the page and click “Advanced” to open Chrome advanced settings. Find “System” sections from the section at the bottom of the page and click “Open proxy settings”. This will open the “Network properties” window. Click the “LAN settings” button on “Connection” tab. 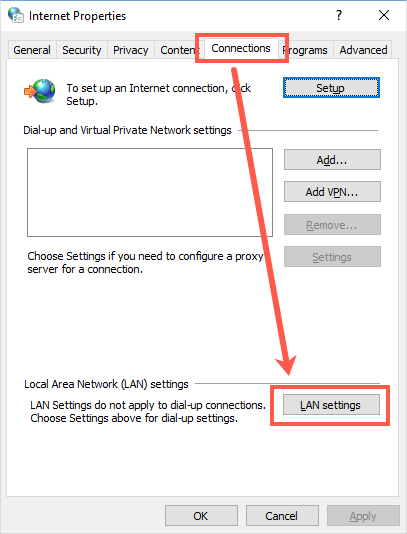 Uncheck all the options on the “Local Area Network (LAN) Settings” wizard that pops up and click “Ok”. Re-run both your VPN and Chrome then test the connection. 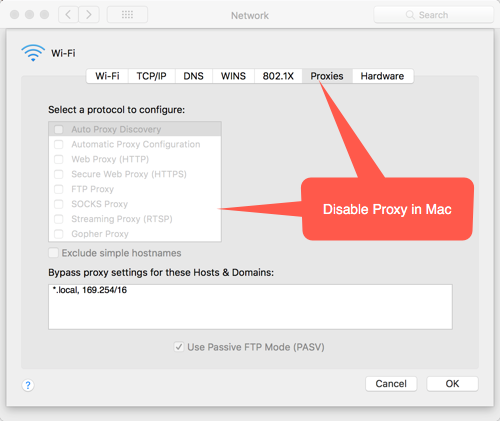 If you use Mac, Chrome will open “Network Preferences” settings. 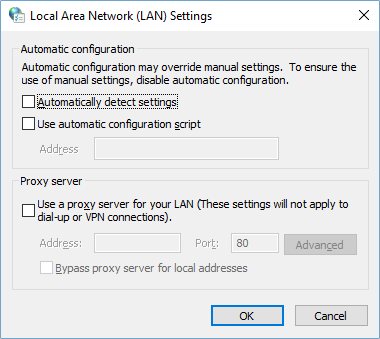 You can disable proxy settings under “Proxies” tab. 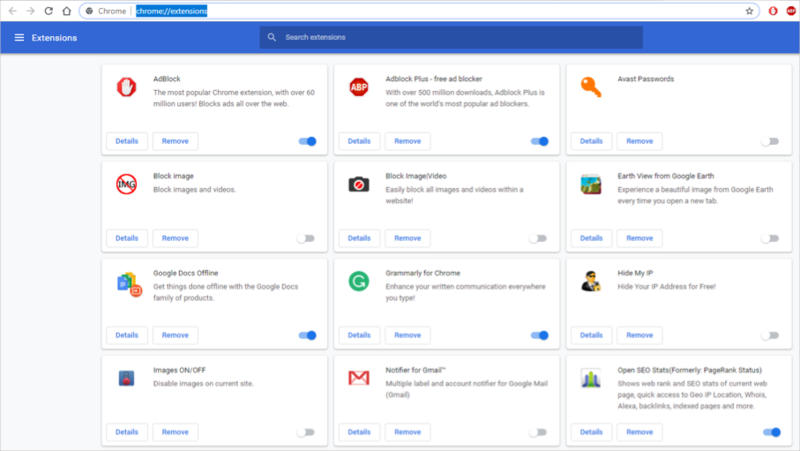 Most of the popular VPN services like ExpressVPN offers Chrome browser extension for Windows and Mac. If you are using Chrome VPN extension, uninstall it and try to use the desktop app. This will help you to confirm the problem is with the VPN server side or on Chrome browser side. Type “chrome://extensions” in your Chrome Address box and press enter. Identify any Proxy-related privacy extensions from the list, switch off the toggle button to disable or click the “Remove” button to uninstall the extension. Restart the browser and try connecting. DNS (Domain Name System) translates IP address to a readable URL, making it easy to remember a site address. Together with your browser, DNS server maintains DNS cache, so that the IP conversion doesn’t have to happen every time you visit a site. This speeds up the sites’ loading time. However, with time these address can be outdated, which can lead to VPN issues. Clearing the DNS cache could solve this problem. Type “chrome://net-internals/#dns” in Google Chrome address box and press Enter on your keyboard. On the resulting page, click the “Clear host cache” button. This will delete all the address entries from the cache. Learn more on how to flush DNS in Windows 10 and Mac. The Firewall controls the traffic of data into your computer while antivirus adds an extra security layer when you connect to the internet. As a protective measure, they can block VPN resulting in Chrome connection failure. You can solve the issue by either disabling them or listing VPN as an exception. 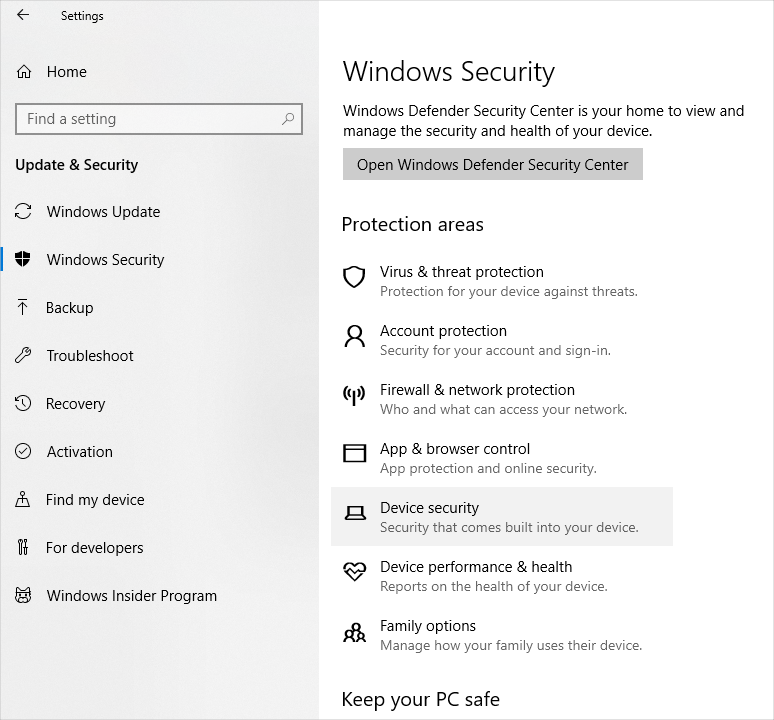 Press “Win + I” keys to open the Windows Settings panel and select the “Update & Security” settings. 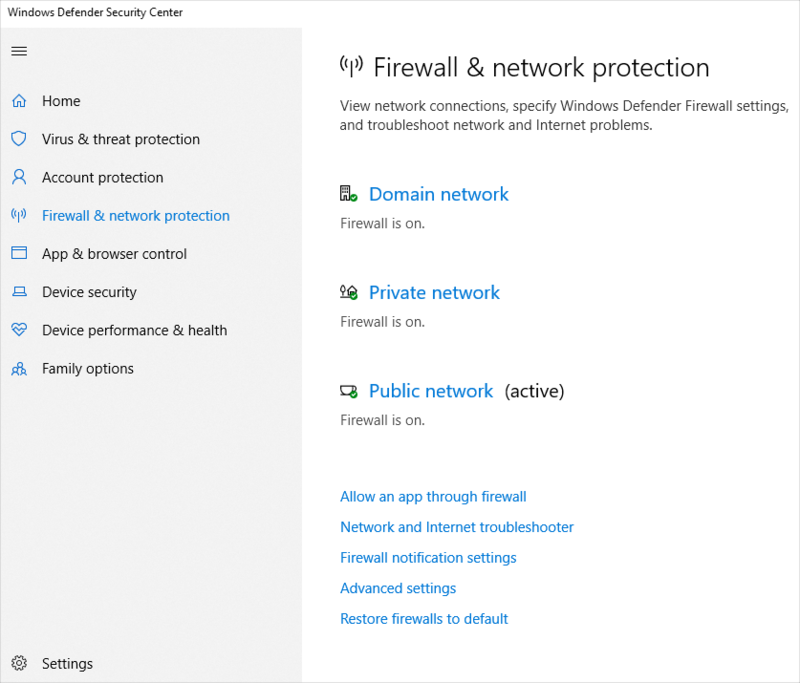 On the left pane of the window, click “Windows Security” and then select “Firewall & network protection” under the “Protection areas” section. To add VPN to the firewall whitelist, click the “All an app through firewall” link. Click on “Change settings” then find the VPN from the list and check both the private and public network boxes. Click “Ok” to exit the window. Learn more on how to setup firewall settings in Mac. You can use VPN for different purposes like accessing blocked sites from your country, organization or institution. The issues could be that your internet service provider or network administrator may continuously update the blocking methods to find and block VPN protocols. If you can’t access the internet through VPN app, ensure to update the app to the latest version. In case, if you are using VPN profile installation then discuss with your VPN service provider to get the updated app. We also recommend using reliable premium providers like ExpressVPN and VyprVPN instead of using free and unreliable service providers. In addition to using updated app, ensure to select the working VPN server. 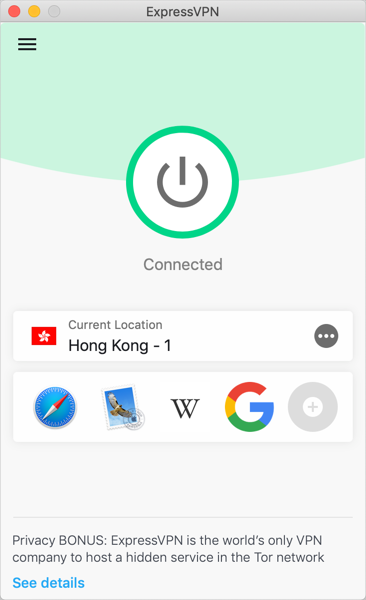 Most of the VPN apps will block the internet access even though it is showing as connected. This is to protect revealing your anonymity accidentally. 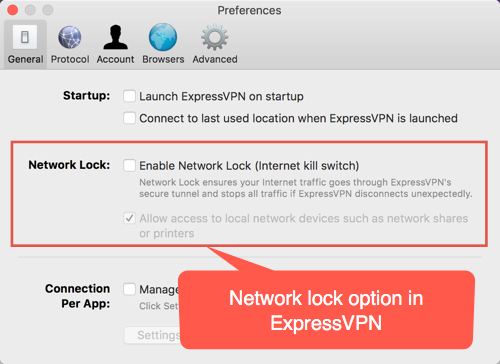 In such case, check the settings of your VPN app and disable the network lock option. VPN is a very important technology when you need to connect local business networks securely over the internet. It also enables you to access sites that could be blocked for your region or to access a private network remotely. However, VPN can collide with other browser or system configurations, leading to connection errors. If you are using Chrome browser, you can try the above solutions to resolve VPN errors.